The arrival of spring brings new life to the garden. But it also brings weeds. The definition of a weed is ‘a plant in the wrong place’. But tackling them is important. They can look ugly and spread like wildfire, plus they take valuable soil nutrients and moisture away from our plants of choice. Getting control of weed populations early on in the year will save you endless grief later on. Once they grow, establish and set seed, it’s much harder to eradicate them. So let’s get stuck in now. Weeds can be divided into two main groups: annual and perennial. Annual weeds are those that grow, flower and release their seeds in one year. The parent plant dies in autumn but only after it has spread around the garden. Chickweed and bittercress are annual weeds. Perennial weeds are those that come back every year and can live indefinitely. Nettles, brambles and dandelions are all perennial weeds. 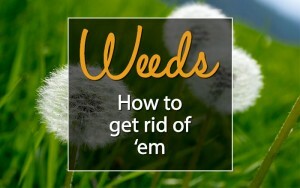 The best method to get rid of weeds is the same as it’s always been: simply to remove them from the soil. Dig them up. Pull them up by hand. Just get them out. There is no getting away from it – the best weeding is done on your hands and knees. Pull your weeds before they seed! Small weeds can be pulled out by hand. 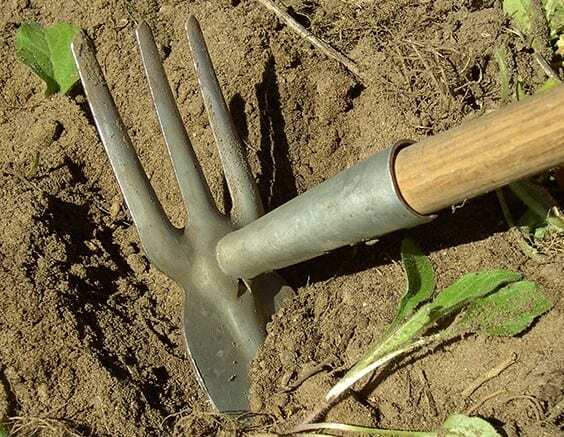 Large or perennial weeds can be dug out with a fork or trowel. Try and remove the weed whole, including all of the root system. Some weeds are incredibly resilient and can regenerate from just a scrap of root left in the soil. If you find it hard getting down on your hands and knees, try using a hoe. Put the blade on the ground and pull it towards you, severing the plant stem. Bear in mind that this method only kills annual weeds and young seedlings. 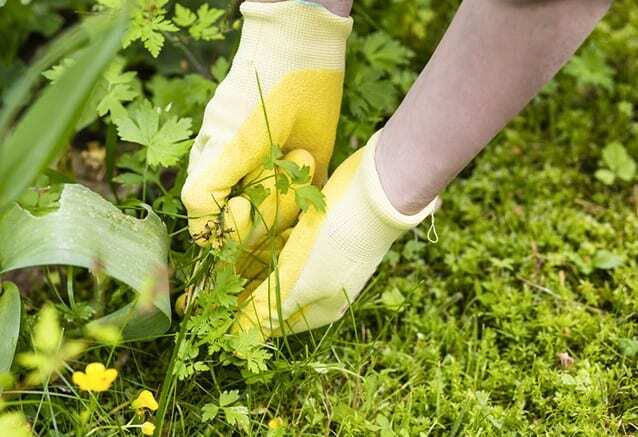 Established perennial weeds will come back again, so you will need to do it regularly. Our bees are suffering at the moment, so anything we can do to help is really important. 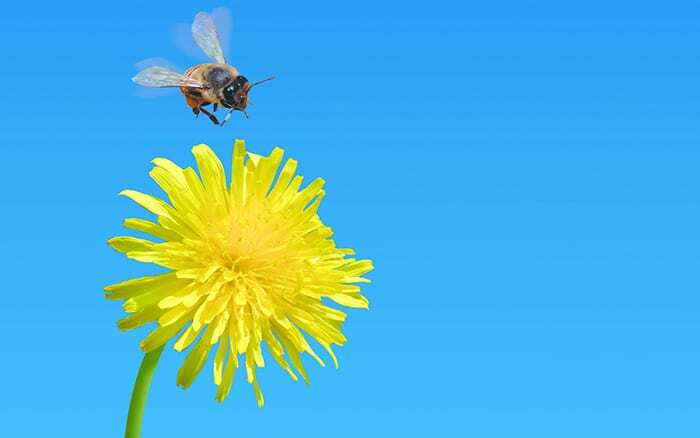 You can do your part by waiting to kill your weeds until shortly before they go to seed, because bees are dependent on the flowers of weeds. This is important – do not put the weeds on your compost heap. Some people say the roots and seeds get broken down, but I don’t take any chances. You don’t want to dig the weeds back into your garden borders! Throw weeds in your green wheelie bin, if you have one. Or chuck them on the bonfire, and say goodbye to them forever. Hi Myra, Anything thorny or prickly should put the rabbits off. Try growing precious plants in containers out of harm’s way! Best way to stop slugs please. There are a few ways to stop slugs eating your plants. You can surround them with a ring of crushed eggshells, which are too sharp for the slugs to crawl over. You can bury beer traps too. Fill some small containers with beer and bury them in the soil, so they are level with the surface. Slugs are attracted to the smell, and crawl in and drown. Most gardeners swear by going out in the garden in the evening, just after it gets dark, with a flashlight. Pick off all the slugs you can find and dispose of them. The best way to keep your plants safe is to employ more than one of these methods, alongside your usual slug pellets too. Hope this information helps you, and good luck. What is the most wildlife and pet-friendly way to keep snail & slug population down? I have cats and regularly dog-sit. I also have 2-3 hedgehogs visit every night to feast on cat biscuits and meat. I won’t use slug pellets as we lost one of our cats when I was younger because our neighbours used them in their garden. It was a very unpleasant and painful death and devastating for my younger sister whose cat it was. This was despite them being supposedly ‘safe’ to use where there were birds and pets about because they apparently looked, smelt and tasted vile. Actually, I’m very surprised you recommend the use of them at all. * I always credit you in the newsletter I help write. Thank You for your comment, its great to hear from you. There are some brilliant natural ways to deter slugs in your garden, such as beer traps and putting down eggshells. You can find some of the best methods on my page here. Having hedgehogs visit your garden is another great asset, as they love to feast on slugs and snails. It is truly awful when our pets accidentally ingest poisons that are left out, and I would recommend avoiding them in your garden completely if you have pets. I hope this is information is helpful and good luck!